20-35% of all calls to the service-desk are related to password problems. Usually the main issue is considered to be the cost for the IT-department. Our statistics however indicate that the user value of self-service is most important! 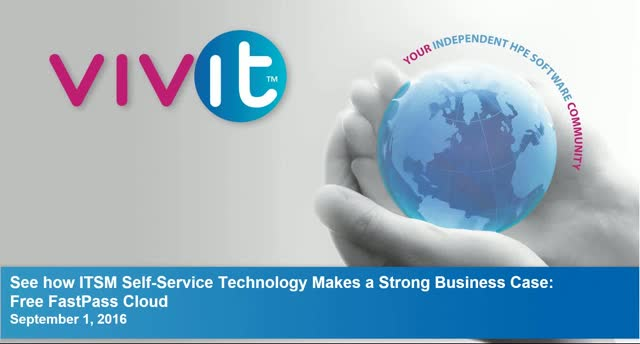 To help the HPE and VIVIT community to get started with the self-service technology, we will introduce the FREE service from FastPass Cloud for VIVIT members from 2000-30,000 users in line with the offer together with HPE for Service Anywhere customers. Join this webinar and learn how you can improve user productivity from the FREE FastPass Cloud service. You will also see how you can get high user acceptance with the extended FastPass. For customers not prepared to go with Cloud FastPass, it is also available on-premise. If data is king, then better make sure you collect ALL data types, right? How slow are the DB calls, is the container host strangled, are those VMs saturated, is the cloud vendor quality of service random? These can and will impact your business. Collect Once - Store Once (COSO): our intelligent data lake makes sure that your precious data lives in one place which means you can do great things with it. Sponsored by Tasktop Technologies, the leader in connecting best-of-breed software delivery tools. • What is “Value Stream Management”? • Does Value Stream Management help to “mind the gap”? Stream Management movement across Software Delivery. This webinar is brought to you by the Vivit Service Management Special Interest Group (SIG). Brought to you by the Vivit Testing Quality and ALM Special Interest Group (SIG). In this webinar, you will learn about how Southern Company approaches automating testing, the automated testing framework we created, why we created it, and how it has been used. There will also be a demonstration of UFT being used to run tests using the framework. This webinar is brought to you by the Vivit Software Lifecycle Integration Special Interest Group (SIG). Anyone who has ever attempted to enforce alignment across many domains/projects/teams in order to allow for global reporting will be well aware of its drawbacks and problems. In this webinar, we will explore another way of achieving global reporting across different domains by well thought through synchronization. Easily Get 3rd Party Metric, Event, Topology, and Log Data into Micro Focus OpsBridge Suite (OMi) … in 3 minutes (for real)! StreamWeaver liberates ‘operations data’ (metric, event, topology, and log) to help IT achieve high availability and optimizing the performance of critical business services. To do this, we automate the distribution of the data from all domains and all clouds to the applications (including Micro Focus OpsBridge Suite – OMi) and teams best positioned to achieve the desired business outcomes. Visualize, Monitor, and Optimize Your Hybrid Cloud Environments with Operations Bridge – A Look At The Next Generation From Micro Focus: Today’s reality is that Hybrid IT demands more from IT Operations. 88% of organizations are sharing data between cloud and on premise applications, and 64% are finding that problem resolution takes longer and is more difficult in these environments. IT Operations teams must be able to visualize, monitor, and remediate issues across virtually any environment before end users are impacted. Please join us to learn how Micro Focus can optimize your Hybrid IT operations. Easily Get 3rd Party Metric, Event, Topology, and Log Data into Micro Focus OpsBridge Suite (OMi) … in 3 minutes (for real)! : StreamWeaver liberates ‘operations data’ (metric, event, topology, and log) to help IT achieve high availability and optimizing the performance of critical business services. To do this, we automate the distribution of the data from all domains and all clouds to the applications (including Micro Focus OpsBridge Suite – OMi) and teams best positioned to achieve the desired business outcomes. Voice shopping is estimated to be $40 billion across US and UK. IoT device is ubiquitous and can be found in every (almost) household. IoT ecosystems help in home automation, smart speakers, home security, productivity, and streaming etc. Digital assistants save time and effort. Why not bring voice intelligence to performance testing? How about starting your morning coffee by triggering smoke load test from your mobile, or from IoT device, or from your wearable. How about getting smart alerts of your load test straight to your inbox. Performance Testing - Powered by Voice also helps your enterprise performance testing pipeline seamlessly. DevOps tools are cool and are needed for an effective Continuous Integration/Continuous Delivery pipeline. But to achieve the ultimate DevOps win for your company, you need to focus on the people. In this talk, we will cover approaches taken at Blue Cross Blue Shield of Rhode Island to enable a DevOps culture. Join us for our next exciting Quality and Testing SIG Talk. Listen to expert speakers, who are fellow Vivit members, on important approaches that you can take with DevOps tools and Performance Testing powered by voice. Why DevOps Tools Can't Deliver Value: DevOps tools are cool and are needed for an effective Continuous Integration/Continuous Delivery pipeline. But to achieve the ultimate DevOps win for your company, you need to focus on the people. In this talk, we will cover approaches taken at Blue Cross Blue Shield of Rhode Island to enable a DevOps culture. Performance Testing - Powered by Voice: Voice shopping is estimated to be $40 billion across US and UK. IoT device is ubiquitous and can be found in every (almost) household. IoT ecosystems help in home automation, smart speakers, home security, productivity, and streaming etc. Digital assistants save time and effort. In 2014, the founders of VerticalRent (www.verticalrent.com) were featured by Microsoft BizSpark for their early achievements with launching the industry leading rental property management and tenant screening software platform for property managers and landlords. In that article, Microsoft wrote: Matt Angerer is an IT professional by day and a landlord by night. At all times, he has an entrepreneur’s heart and mindset. A lot has changed since 2014. VerticalRent has more than quadrupled in the sheer number of landlords using the platform from every corner of the United States. The one thing that has not changed is that VerticalRent remains a small operation without employees that epitomizes the concept of a Lean Startup. If you're an IT professional by day who has been toiling with the idea of launching your own "side-gig", you'll want to tune into this BrightTalk webinar to learn how Matt Angerer, Founder of VerticalRent, started with a simple idea and scaled it into a platform that services over 25,000 landlords and nearly 50,000 renters across the United States in 5 short-years -- all while keeping his day job, running his rental properties, and financially supporting a family of 4. Join us on Wednesday, October 3rd at 9am PT / 12pm ET for this live interview! In the ever-changing world of Software Testing, the ability to complete more than one task at a time is King. Let me show you how to create enablement content to train employees up or walk them through the next test case or software release, without actually doing anything extra, using a content creation tool called Micro Focus ART. Many decision makers will say they need more information. The reality is that most leaders are actually drowning in information. What they really need is to move from information to clarity to insight. Attend our talk on building a hybrid it blueprint to see how CloudGenera can quickly take large amounts of data about your applications and provide data-driven analysis on best execution venue. We believe these sorts of insights should happen in minutes not months. Join the Vivit Worldwide channel for unbiased, trusted, and field-tested best practices on Micro Focus Software products and solutions. You’ll also be able to hear from thought-leaders from around the world to help you tune in your day-to-day life to what will be happening in IT in the years ahead.